In my grand scheme of a continuous improvement movement toward optimal health, I have recently added new attention to not cleaning my plate. It’s an old habit, but eating everything served has long contributed to my consuming more food than my body needs at a sitting. I’ve decided to take another crack at altering that pattern. It’s a project I tried off and on in the past, just like my attempts to stop snacking directly out of the bag, or trying to get a full 8-hours of sleep a night. I have not accomplished everything I set out to achieve. I’m hoping to springboard on the success I have been experiencing with my daily regimen of planking and stretching exercises. Actually, it parallels well with my recent decluttering effort. The latest accomplishments have inspired me to keep going to the next level of clutter out in the shop. My planking success –started about 6-months ago and still making daily progress, well beyond the initial 30-days-in-a-row goal– seems to be inspiring me to take the next step toward better (and consistent) attention to portion size. This whole portion control thing rides on top of my earlier focus to kick a sugar addiction and rein in the percentage of my daily sugar consumption in my diet. 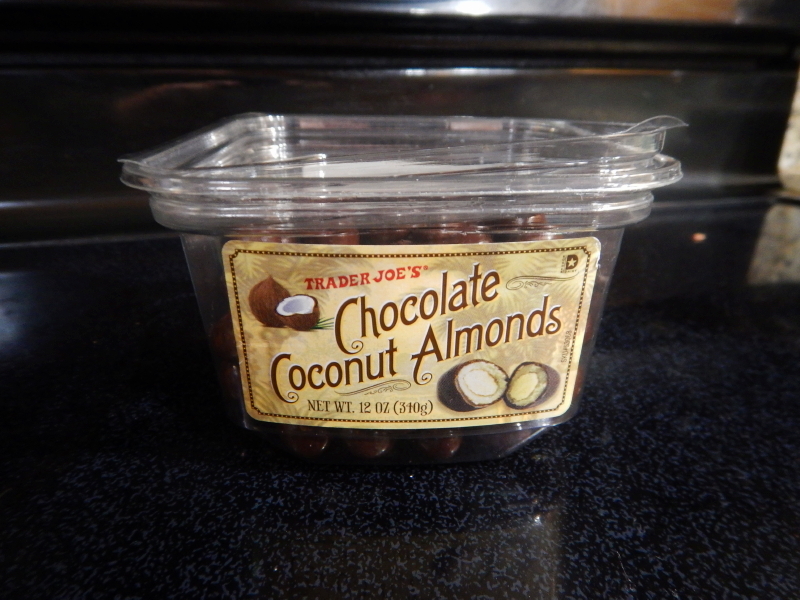 Last night, I took a moment to calculate the number of grams of sugar in a serving of Trader Joe’s Chocolate Coconut Almonds that Cyndie brought home as a treat on our anniversary. It’s the coconut that sends these over the top. It calls out to me every time I walk past them. Sixteen grams in a 1/3rd cup serving, which is a little under 1-gram per coated almond. I have tried to satisfy myself with eating just 2 or 3 almonds at a time, but then the challenge I face is to honestly track how many little visits to the well I make in a day. Craving is a powerful thing. I’m happy that I have developed a bit of a craving to do my daily planking routine, and I struggle with the craving to sleep that washes over me at times of the day when I can’t. Now, if I could just get myself to crave small portions of really delicious large servings of food on a plate in front of me, I’ll really be getting somewhere. Here’s to continuous movement toward optimal health, one step at a time. Mind, body, and spirit.